‘Ekushe Manabikata O Abritti Charcha Kendro,’ a voluntary and cultural organisation, celebrated its second anniversary through different programmes in the port city on Friday. The programmes with the slogan ‘Antaro mamo bikashito karo,’ was organised at AK Khan Memorial Auditorium of Fulki School. BTV Chattogram Centre General Manager Nitai Kumar Bhattacharya was present as the chief guest at the programme presided over by Banker Sabyasachi Chowdhury. Chattogram Medical College Hematology department Professor Dr Shahed Ahmed Chowdhury, Chattogram Jila Shilpakala Academy General Secretary Saiful Alam Babu, Poet and Journalist Kamrul Hasan Badal, National Bank Limited Executive Officer Mostafa Mahbub Babu, and Sammilito Abritti Jot artist Anchal Chowdhury were present as special guests at the programme among others. Ekushe Member Secretary Anirban Chowdhury delivered welcome speech at the programme while Freedom Fighter Jahid Ahmad was present as the prompter. 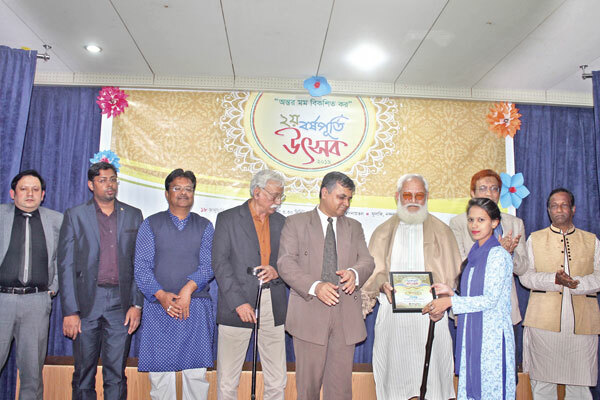 Different social, cultural and voluntary organisations including CITG Blood Bank, Bodhan Abritti Parishad, Uchcharok Abritti Kunjo, Muktodhoni Abritti Sangshad and Promiti Sangskritik Academy greeted the Ekushe with floral bouquets. Later, a free blood test campaign was also carried out marking the founding anniversary of the organisation.